Review by AllTheBestFights.com: 2015-07-12, pretty good fight between Jorge Masvidal and Cezar Ferreira: it gets three stars (UFC Performance of the Night). Jorge Masvidal entered this fight with a professional mma record of 28-9-0 (43% finishing rate) and he is ranked as the No.18 lightweight in the world while his opponent, the black belt in Brazilian jiu-jitsu Cezar ‘Mutante’ Ferreira, has a record of 8-4-0 (62% finishing rate) and he entered as the No.63 middleweight. Both fighters have lost their only fight of 2015: Masvidal was defeated by Al Iaquinta (via split decision, Iaquinta vs Masvidal) while Ferreira lost to Sam Alvey (=Alvey vs Ferreira). 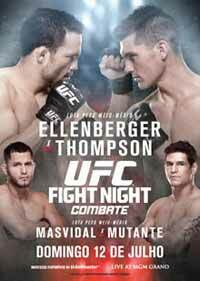 Masvidal vs Mutante Ferreira is on the undercard of Jake Ellenberger vs Stephen Thompson – UFC TUF 21 Finale (American Top Team vs Blackzilians). Watch the video and rate this fight!